On Monday the fossil shown below was put up. How did you do? We got some very good suggestions about it possibly being a horn or a tooth. It isn’t a horn, not exactly. It does also bear a remarkable resemblance to some spinosaur teeth I’ve seen, which was one of the guesses. But it’s not a tooth either. Congratulations to Laurenwritesscience, who really knows her fossils for correctly identifying it as a horn coral. Modern day coral are pretty much all in the group Scleractinia, meaning stony rays, known as the stony corals because they make an external skeleton out of aragonite, a form of calcium carbonate, very similar to calcite. They are the major reef builders in modern oceans. But it wasn’t always that way. Before scleractinians, there were tabulate corals and rugose, or wrinkly corals. Rugose corals, like modern corals formed both large colonies and solitary structures. The solitary rugose corals, like this one, are called horn corals, obviously for their commonly stated similarity to horns. Rugose corals first appeared in the Ordovician Period roughly 47o million years ago, give or take 20 million years. 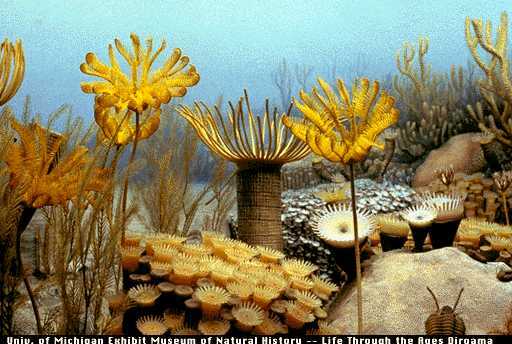 They became important reef builders in the Devonian Period and remained a highly visible presence until the end of the Permian about 250 million years ago. They, like almost everything else, succumbed during the Great Dying, as the mass extinction of that time is called. As a result, if you want to find them in Arkansas, you should try the marine limestones in northern Arkansas, throughout the Ozarks. The best place to find them are the Mississippian rocks, such as the St. Joe, Boone, and Pitkin Formations. Rugose corals, like all corals, are more than just the stony skeleton most people think of when they see coral. Inside, the animals themselves grow as polyps sitting, in the case of horn corals, a stony cup called a calyx, which they constantly build up as they grow. When alive, the pointy end went down, permanently attached to the surface upon which it grew. Inside the calyx, they grow septae, little walls used to provide structural support for the skeleton and to hang themselves on (while this may cause one to picture a very depressed polyp, a better visual image would be hanging pictures or cabinets on a wall). Rugose corals typically grew six main septae, forming six compartments. Four of the compartments were further subdivided by minor septae. All of these septae radiated from a central axis, or rod supporting the whole structure. The four main compartments is one reason why they are sometimes called Tetracorallia. Growth of septae in rugose and hexacoral. Paleo.cortland.edu. This is one of the key characteristics that separate them from modern day coral, which are members of a group called Hexacorallia, noted for having six main septae and six main compartments, all of which are furhter subdivided with minor septae, thus having six-fold symmetry (you can draw six lines through the center of the organism in which one side is a mirror image of the other). Hexacorallia also include the sea anemones, also noted for having six lines of symmetry. The Rugosa, on the other hand, due to the four compartments, often exhibited only bilateral symmetry, meaning there was only one plane you could draw to find a mirror image. The polyp forming the living organism was a tiny creature with a simple sac-like digestive tract, meaning there is only one opening. Food passes into the mouth and waste comes right back out the same way. This is the typical pattern seen in almost all of the Cnidarians, the group in which corals are a part, along with animals like the jellyfish. Like the jellyfish, coral polyps have nematocysts, stinging cells they use to capture prey. 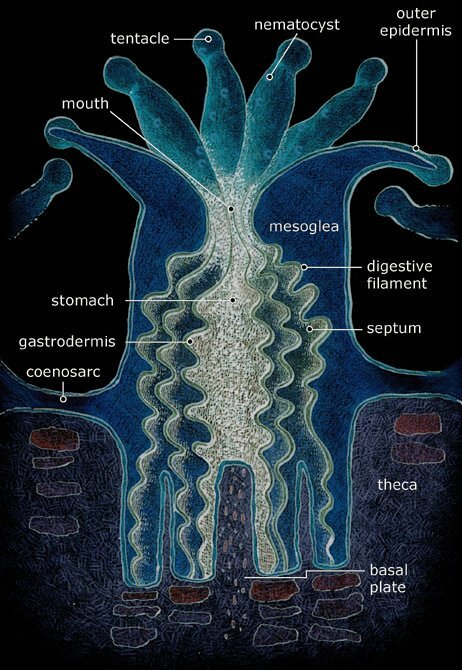 Surrounding the mouth, and where one would find the nematocysts, are a ring of tentacles, forming a flower appearance, the reason the group containing all corals is called Anthozoa, the flower animals. A lot of group names and you might be getting lost, so I’ll summarize the names: Horn corals are a part of the Rugosa, or rugose corals, also called Tetracorallia, which are a part of Anthozoa, along with all the other corals and sea anemones, which are a part of Cnidaria, which also includes the jellyfish among others. The modern corals are mostly scleractinians, or stony corals, which are a part of Hexacorallia, which are Anthozoans and thus Cnidarians (which you may also see referred to as coelenterates). Like all members of the Anthozoa, rugose corals almost assuredly reproduced asexually by budding or sexually by releasing both sperm and eggs. In many corals, most of the polyps in an area will do this at or near the same time, called broadcast spawning, creating a massive cloud of eggs and sperm floating around the reef. I have read this is a fascinating sight, if rather disturbing to some. Why do they do this? Because everything else in the reef considers them good eating, so the only way to ensure that some escape long enough to survive and grow is to simply overwhelm them with sheer numbers. This idea is often called predator satiation. It also gets around the fact that coral can’t move, they are the ultimate homebodies. The only hope they have to meet a good mate is to just put the seeds of their offspring into the wind, or in this case, currents, and hope for the best. Most corals do not depend just on what they can capture or filter out from the water. They also have a mutualistic relationship with photosynthetic dinoflagelates and zooanthellae, or single celled algae. They algae get a safe place to live and nutrients, while the coral gets the products of the photosynthesis, such as oxygen, sugars and amino acids. Normally the coral don’t depend upon the extra energy derived from the photosynthesis, but when times are tough, the added supply can see them through, allowing both the coral and the algae to survive longer. The mutualism certainly provides a much more abundant resource supply for the coral, allowing them to grow more efficiently. We don’t know if rugose coral did this, but it is reasonable to assume they did for now. Of course, this means that corals who use this relationship are restricted to shallow, clear waters conducive to the growth of algae. We do know that they formed close relationships with stromatoporoid sponges. The sponges formed the backbone of the reefs, with the coral growing within the sponge reefs. What sort of association beyond that is not known though. Life in the Devonian seas. UMich Mus. Natural History. 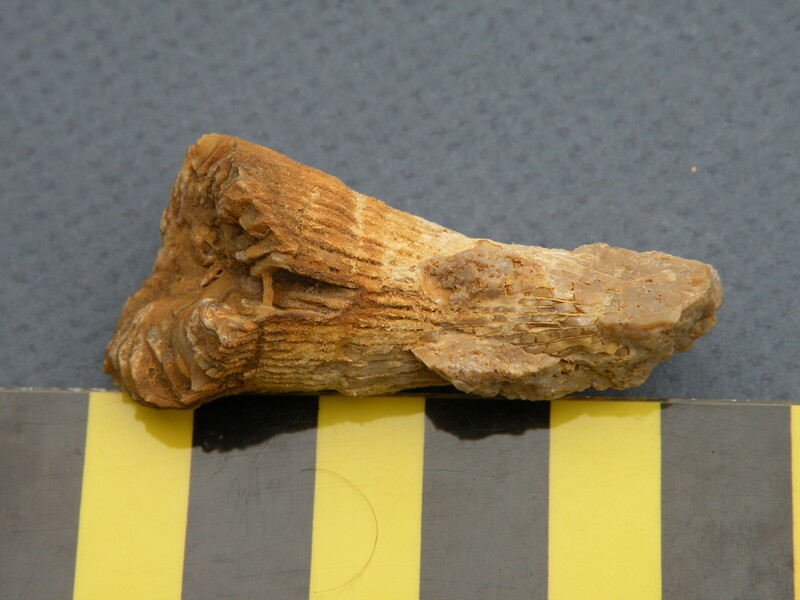 By paleoaerie in Fossils of Arkansas, Mystery Monday, Paleontology on April 11, 2014 .